Click to on the thumbnails below for more information and full-sized images. The Grove at Attleborough (not to be confused with the grand house of the same name at Weddington), was a large house which once stood in the hamlet of Attleborough. It was located in Garrett Street on a site where there are some sheltered accommodation flats today and to the left where Highfield Road is situated. The whole site has been changed from this idyllic backwater whose gardens backed on to the parkland of Attleborough Hall. To the left behind the trees was once, the Wide Yard, a courtyard of cottages which led out to a footpath across the edge of the Hall gardens into what is now Gadsby Street. 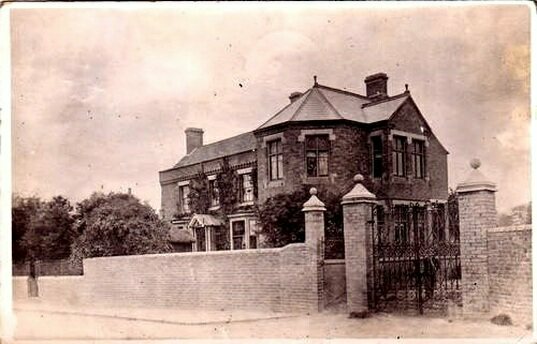 Ebenezer Brown bought the house from Robert Swinnerton in 1876 and it is possible the projecting part to the right was added later as there are two different styles of architecture and the right hand part looks later. The outer walls in this view look new so the photograph may have been taken to record these. There appears to be someone looking out of the bedroom window and possibly a workman standing behind the gate. All this new work paid for by beer and Mr. Brown's property holdings. He sold 12 pubs he owned for £23,000 to Leamington Breweries late in the 19th century and owned a substantial amount of property around the district including Bosworth battlefield site. He also had built a holiday home in Rhyl.